Apache just a minute ago has released the final version of OpenOffice 4 to the public. 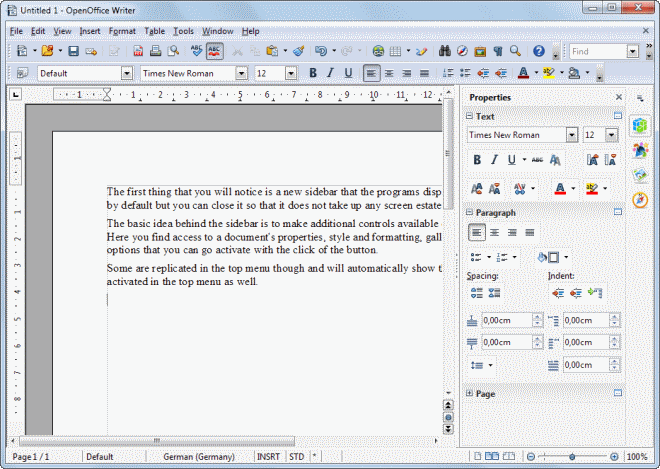 The new version marks a new milestone project and a major update of OpenOffice 3.4. The new Office program boasts an impressive amount of changes, new features and bug fixes that have found their way into the final version. This includes support for additional interface languages, better Microsoft Office interoperability, enhancements to the various programs of the suite, and a new extensions website that launches alongside it. You can download the latest version directly from the official website where it is available for all supported operating systems and languages. 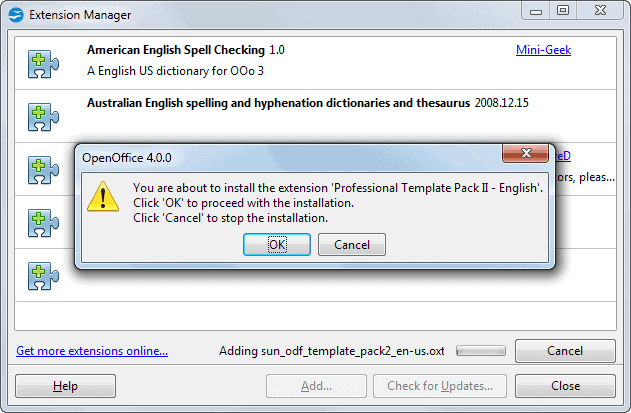 If you are new to OpenOffice, you may want to download the full installer as it ships with all components that you need. I strongly suggest you use custom installation to add or remove components that you do not need. This includes base components such as Impress but also components such as Quickstart, dictionary files or Windows Explorer integration. The first thing that you will notice is a new sidebar that the programs display on the right. It is open by default but you can close it so that it does not take up any screen estate. The basic idea behind the sidebar is to make additional controls available on widescreen monitors. Here you find access to a document's properties, style and formatting, gallery or navigational options that you can go activate with the click of the button. Some are replicated in the top menu though and will automatically show the status change when activated in the top menu as well. You can adjust the width of the panel easily via drag and drop, and will notice that the controls will change their size accordingly up to a point. It is furthermore possible to undock the sidebar from the window so that you can move it around freely on the screen without interfering with the actual OpenOffice window underneath. A second big change are interoperability improvements that the developers made in OpenOffice 4.0. The release notes highlight those changes in detail and with screenshots that show how something looked in OpenOffice 3.4.1 and how it looks now in OpenOffice 4.0. Numbering and bullets attributes determined by the paragraph end mark in MS Word. Keep special numbering when saving or opening ppt presentations. Support for special tiled fill backgrounds. The fill attribute of graphic backgrounds in tables are now displayed correctly. Support for PPT table connectors. Fit shape to text properties for right notched arrows now imports correctly. 3D effects are kept on import. Pie chart height is kept when Excel spreadsheets are opened. The range specified by a reference formular or name range is now supported. Chart names are now shown through VBA API by clicking a button. Data filter function on merged cells is now supported. Use-defined format code in XLS cells is now supported if the value is true or false. GetPIVOTDATA in Excel is now supported. Format Code "0_;.00" is now supported. Docx outline level is now supported. Table background color from table style in docx files is now supported. Additional numbering and bullet types in Docx. Font color in tables in pptx is now supported. New color palette that is arranged in a new scheme, offers more colors by default and makes selecting colors a simple process. The gradient tablet has been improved. It is now larger, and better sorted for easier access. Gradients have been all kept but new ones have been added as well. Various enhancements to gallery themes and existing galleries. The selection visualization and user interface has been refined. Enhanced conversion to bitmap graphics and enhanced filltype bitmap. Enhanced Copy and Paste, for instance to copy an object from OpenOffice into an external image editor, manipulate it there, and copy it back to OpenOffice without quality loss. Enhanced Drag and Drop when dragging and dropping graphics and elements. The picture crop mode now lets you preview the change. Speedup of graphic rendering and fixing of resource leaks. The extensions website has finally received an update. 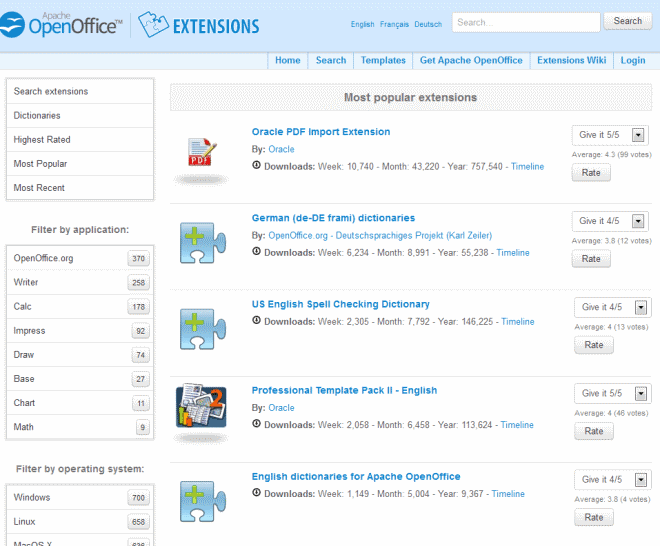 You can head right over to OpenOffice Extensions to download additional tools for Open Office. The left side of the page displays various filters, for instance for application or operating system, while the main content area the filtered extensions for OpenOffice. To download an extension simply select it on the website and click the download button afterwards. You can download it to your system or select to open it directly in OpenOffice 4.0 to install it right away in the program. This opens the extensions manager displaying a prompt to you that details the name of the extension that you are about to install. You can still cancel the operation at this point in time, or go ahead with it. An Extension Software License Agreement may be displayed that you need to accept before the extension is installed on the system. Especially the interoperability improvements are a big step forward for OpenOffice, and the resurrection of the extensions feature is certainly a step in the right direction as well. The sidebar on the other hand does not have that much of an appeal yet, but since it can be hidden easily enough, it should not be of concern to users of the application. The real question is what new compared to LibreOffice, the fork of OpenOffice that has made 4 major releases in the time OO has managed 1. The number of free office suite offerings lately is really quite impressive. When Open Office was supplanted by Libre Office, I moved to Libre because I felt it was receiving more continuous development and updating. Lately, I have also been using the very capable Kingsoft Office suite. I like that Kingsoft Office has a much smaller footprint on the system, yet is still a quite capable office suite. But, now, it is getting difficult to decide which one to stick with… Open Office, Libre Office, Kingsoft Office… and then, there are the multiple online office suites. There are fewer and fewer reasons these days to pay for an overpriced Microsoft Office. I switched from Office to Libre a little while ago and love it. Loads so much faster and runs so much better to do the basic things I need it to do, not to mention no Ribbon (I got sick of that interface so quickly). I was considering OpenOffice, but after reading about why LibreOffice was made, I decided to go that direction. So what’s the general consensus regarding OpenOffice vs LibreOffice? I know why Libre forked, but since Open is under Apache now have things changed much? If someone were looking for a MS Office alternative right now would Libre still be the better choice? For me, Google Docs more than suits my needs. I think Libre Office currently has a broader base of support in terms of both users and contributors to the development of the suite. Open Office has more name recognition. Agree, the big question is Libre v. Open. Last I checked, Open had better user support, but that was a year ago. Libre’s development pace seems faster. Kingsoft, Softmaker and Abi freeware are not in the running in my view, because they don’t write industry-standard .docx format (even Open/Libre is disappointing in that some basic features such as page backgrounds are not saved in that format.). And their paid ware isn’t a much better deal than some MS Office offerings. My preferred free solution is MS office 2010 starter (adware), next is Libre. I use Libre Office. It comes standard on a few Linux distros now too. Linux Mint is one of them (Get Cinnamon desktop version if you go to try it out). Open/Libre Impress is a good “presentation” tool. Better than Powerpoint in some respects. I use it to make .PDF manuals actually, not presentations. Doing documents with mixed text/graphics/hyperlinks is much easier in Impress. Thanks for the news, Martin. I’m still with OpenOffice, because two things I use heavily were changed/broken in Libre: all content table expended in Writer Navigator (Libre had it all folded, and no command to expand it all easily), and Cyrillic .rtf loading were broken, what lead to heavy slowdows or even inability to load some (fix went to Libre 4 , but I didn’t use it much). Somehow Open was better than Libre on .rtf even after the fix. I won’t say that my needs are what most users need, but for me that things are of high importance, so until Libre will have what I need, I remain with Open. Don’t know if all be OK in AOO 4, but will try it. Apache claims it’s more “interoperable” with OOXML. This is a lie: it doesn’t *write* OOXML at all. LibreOffice does that. *tl;dr* AOO doesn’t write OOXML, can’t slot into your actual office work, LO can. > AOO doesn’t write OOXML, can’t slot into your actual office work, LO can. Not for all regular work requires that OOXML. I explained above why for my regular work AOO is better than LO. But because both AOO and LO are free (as a beer :) ), one can install both and have best of both worlds (what suits them better in the particular situation). @bob, you should save for documents into DOC format if you must give it to someone using a version of MS Office that does not understand ODF. This is not rocket science. Why LibreOffice is pushing OOXML writing on its users is odd. Oh right, now I remember. Novell, now Attachmate, was a big supporter of OOXML, paid by Microsoft to promote it in ISO, while the rest of the free world was fighting against it. That same team that promoted OOXML is now promoting LibreOffice. Yes, yes, it must be a conspiracy theory on the part of LO – not simply obvious functionality missing from AOO and you making excuses. Real offices run on MS-OOXML these days. Saying “why don’t you save in this other old format and see if your coworkers don’t choke on it” is an excuse for your lacking functionality. In LO, the DOC, DOCX and RTF filters are all part of the same module, because they’re basically the same format serialized different ways. So why can’t AOO do that? Because like it says in Wikipiedia, AOO is a moribund project and even its sponsor IBM can’t be bothered putting enough programmers on to achieve obviously wanted functionality. I worked in the real offices of big companies, and nobody cares if I send the document out in .doc , not .docx (what I preferred to). It’s true that it’s better to have a possibility to save one, but I didn’t see why it is critical. For me the other part of functionality were more important, and they were changed or broken in LO. and see that it took for LO almost a year to fix a bug that was critical for me. With my best regards for LO, I’m cautious of it because of issues I had, and functionality I needed removed, — while it is still available in AOO. And I want to repeat that when you can install both (and free), the difference doesn’t worth that much, — choose that you like and have best of both worlds. I would like to change from MS to any Open Office if only the developers would improve on the Database, Base as a desktop application. I tried it on occasions, but found it to be too much of a slog to get going with. On my Windows 8 OpenOffice 4.1.0 Impress (spreadsheet) app, there are two sidebars, and they are both to the left of the spreadsheet (I have a wide screen). One is the Gallery. When I clicked the Applause sound in the Gallery, it hung my computer (no mouse click actions, no keyboard responses) and played a horrible noise at top volume. Amazing. I had to hold down the power button to force the computer to halt uncleanly and then restart twice. No one else has reported this bug, and it seems impossible to close these two sidebars in Impress.